Are you as obsessed with The Great British Baking Show as I am? I’m actually quite sad that the latest season just ended. For the finale, the contestant’s technical challenge was to make Mary’s Victoria sandwich without a recipe. A Victoria sandwich is is a two-layer light sponge cake filled with a layer of jam & buttercream. Seeing as how I am not British – not even close – I am only able to take Mary Berry’s word that this is a classic cake & that the jam should be raspberry (with “all the bits”, as she says). I’ve been wanting to try to create one of the recipes from the show since I started watching Season 1 on Netflix earlier this summer. I figured this one shouldn’t be terribly difficult. Not like the Prinsesstårta! The only thing is that Mary Berry’s recipe is written in U.K. Measurements. I have no idea how much 225g of self-raising flour is. The PBS website is nice enough to link to this conversion site at the bottom of the recipe, but it only converts grams to ounces – not cups. I still have no idea how much 8oz of flour is. So with my little food scale & Google, I came up with the below recipe conversion. Hence this is Mary Berry’s American Victoria Sandwich. I also made my own caster sugar with a food processor. I was going to skip it but I read that regular granulated sugar wouldn’t give the sponge the right texture & could be grainy. To make enough caster sugar for this recipe, I pulsed 1 1/4 cup of sugar in the food processor for about 30 seconds. I was all set to follow Mary’s proportions for buttercream (7 tbsp buter, 1 3/4 cup powdered sugar if anyone is interested), but then I accidentally threw the whole stick of butter in the mixer. So 2 cups of powdered sugar it was. It’s so much easier to use the whole stick of butter anyway! 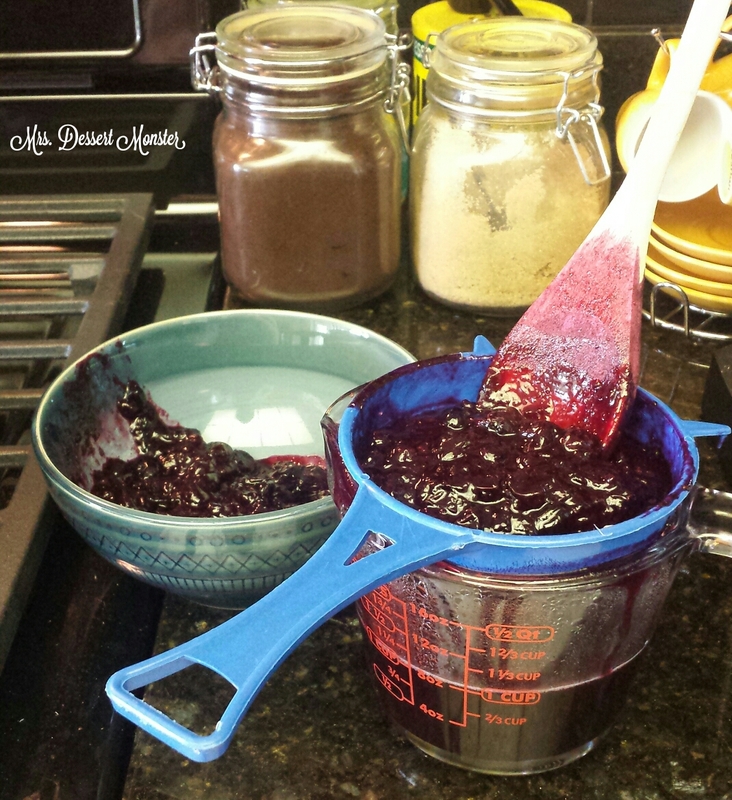 I did cheat a little & used store bought raspberry jam – seedless. Sorry, Mary. I know you like “all the bits”, but my husband does not! My 2 sponges domed up more than I would have liked in the middle, so I did trim them. But that just meant I got to taste test them before serving them to my friends! I cannot tell you how this compares to the British original. I can only tell you it was delicious! Preheat the oven to 350F. Grease two 8in round cake pans & line with parchment paper. Divide the mixture evenly between the cake pans. 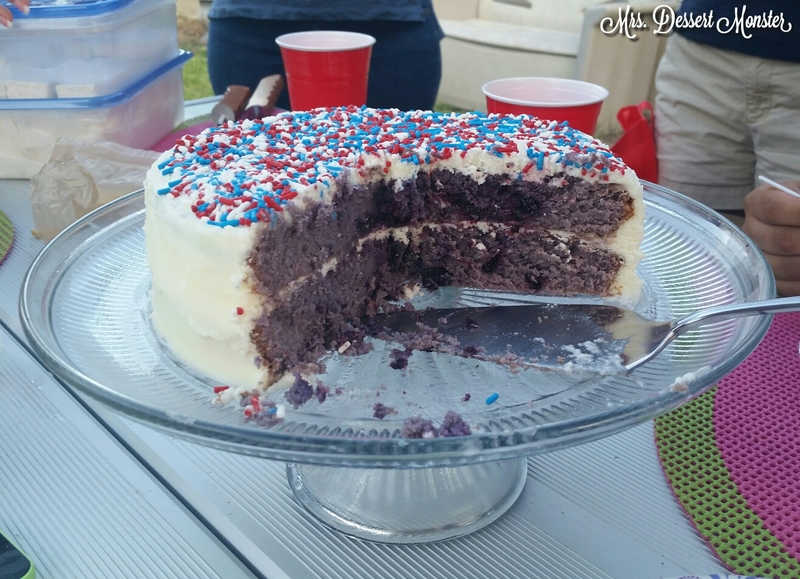 Use a spatula to gently smooth the surface of the cakes. 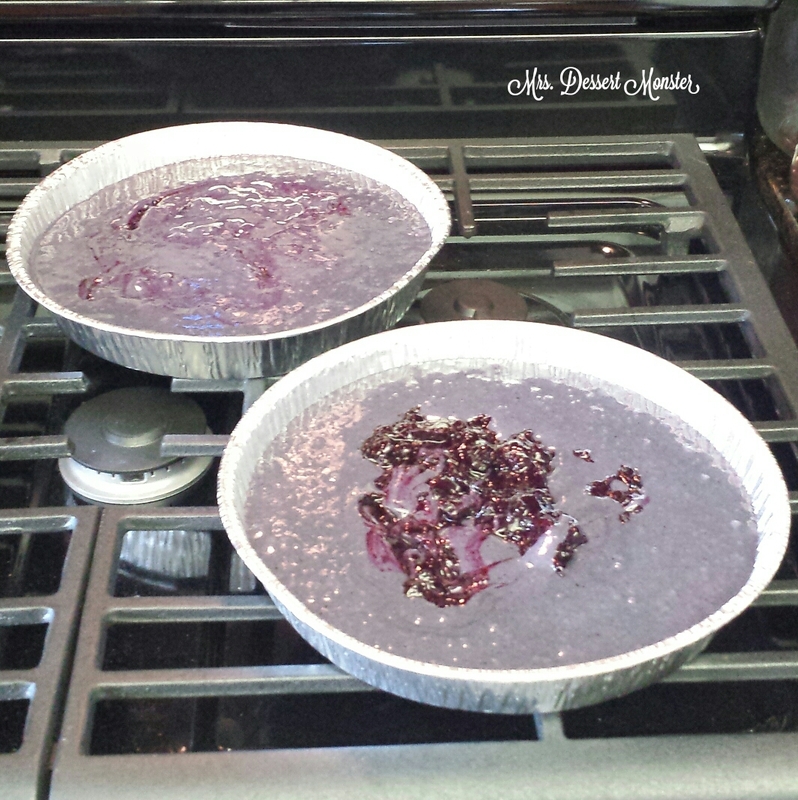 Place the cake pans on the middle shelf of the oven & bake for 25 minutes. Don’t open the oven door to check them until at least the 20 minutes mark. When the’re done, remove them from the oven & set aside to cool in the pans for 5 minutes. Then transfer onto a rack to cool completely. 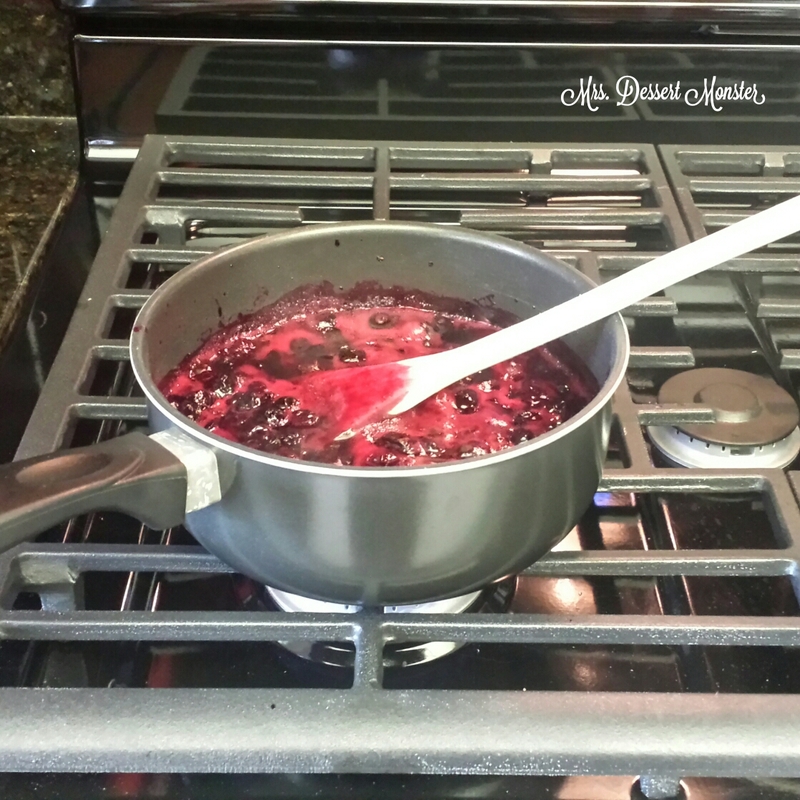 Using electric mixer, beat the butter in a large bowl until soft. Add half of the powdered sugar & beat until smooth. Add the remaining powdered sugar & 1 tablespoon of milk. Beat the mixture until creamy & smooth. Add the remaining tablespoon of milk if the buttercream is too thick. Choose one of the sponges to be the bottom & put it down on to a serving plate. 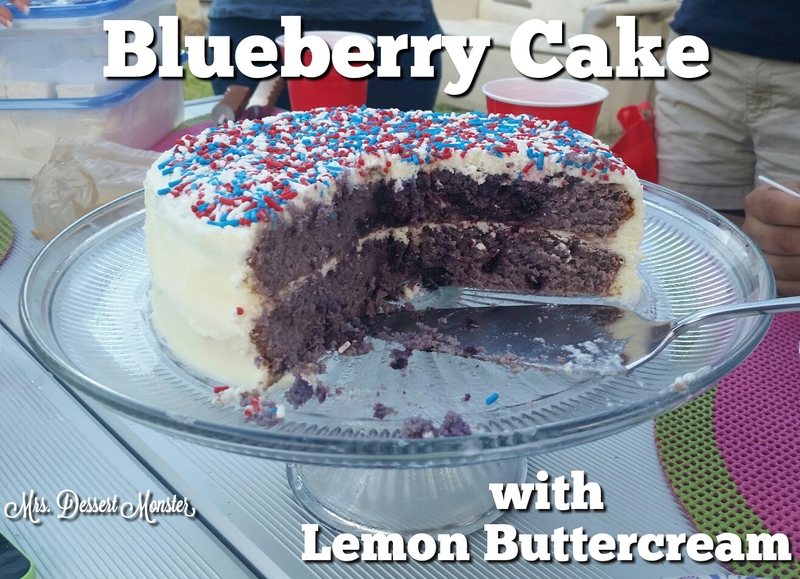 Spread the raspberry jam (store bought or homemade) on the cake, then pipe the buttercream on top of the jam. Place the other sponge on top & sprinkle with caster sugar to serve. July 30th was National Cheesecake Day! I celebrate this day every year! Actually, The Cheesecake Factory lets me celebrate this day twice a year – their half priced cheesecake special is 7/29 & 7/30! The Mr. & I went to The Cheesecake Factory on the 29th & had some delicious cheesecake – for dinner. This was actually the 3rd year in a row we’ve done this. I love our traditions! The 30th we had a nice dinner with some friends we hadn’t seen in a while. A real dinner with protein & veggies & everything. And, of course, dessert. 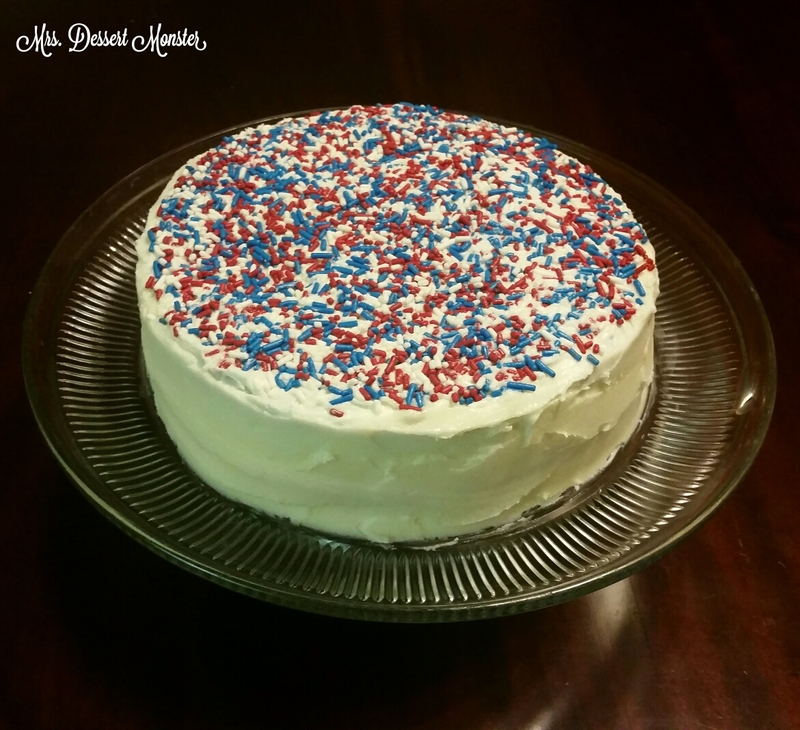 Being National Cheesecake Day & all, I wanted to make something cheesecake-y. 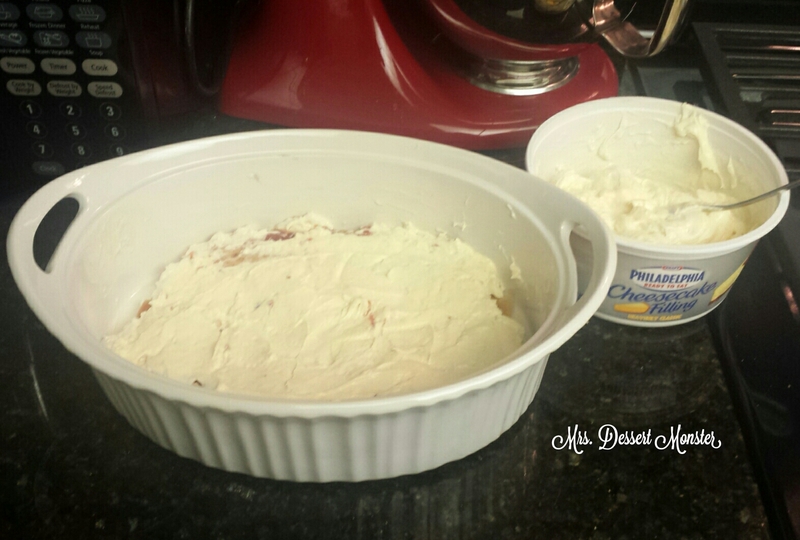 I knew I wouldn’t have the time during the busy work week to make a cheesecake from scratch, so I started thinking of a recipe using pre-made cheesecake filling. 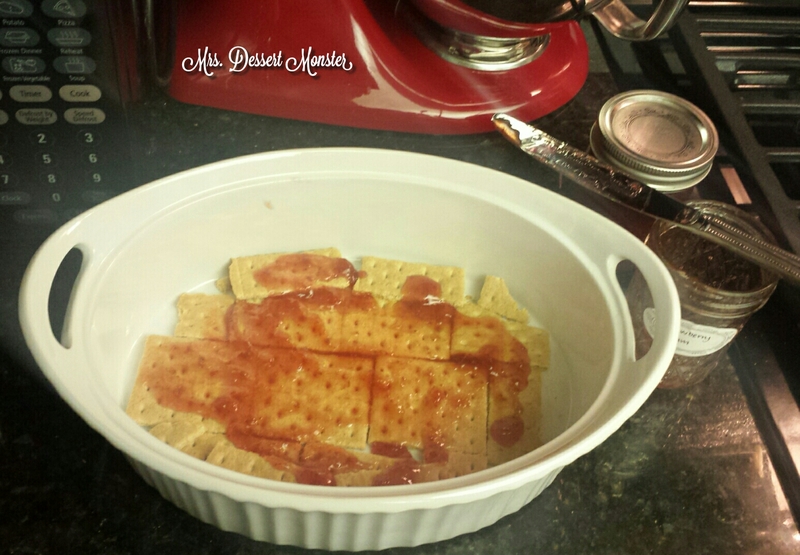 Then it came to me: graham crackers + cheesecake filling + homemade strawberry jam! But then I thought to myself, “that sounds a little too basic & predicable. How can I spice it up a little?” That’s when I remembered that I had just a little bit of lemon buttercream left in the fridge. NOW we’re talking! 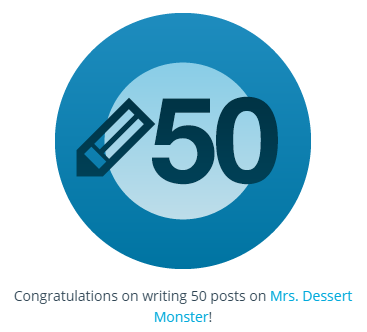 I had to look up what exactly an icebox cake is to see if I can call my dessert that. The answer is yes. 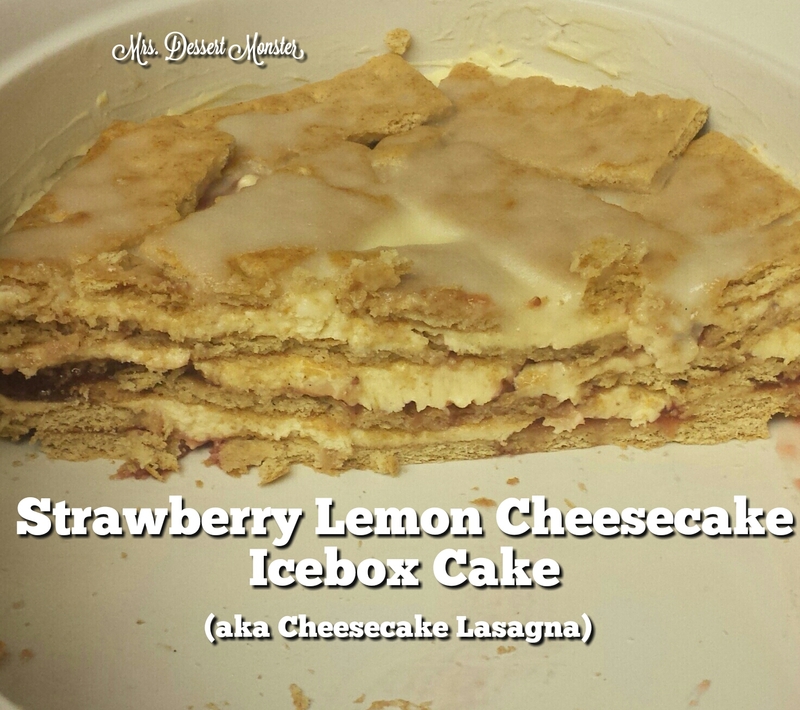 My husband preferred the term Cheesecake Lasagna, though. I kind of like that, too! The steps are easy! Just layer to your heart’s content. I know, I know, it would have been much easier in a rectangular pan. Well I ain’t got one! Plus, I wanted to use my fancy Corningware that I got as a wedding present! It got easier as I added more layers. 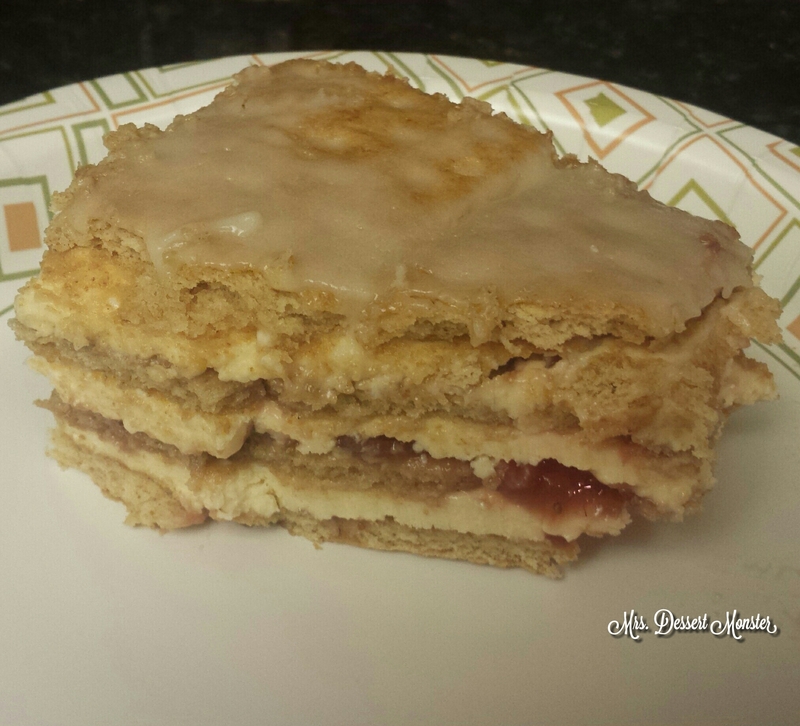 I did 3 layers, plus a top layer of graham crackers. That’s where the lemon buttercream came in! Off to the fridge to chill. 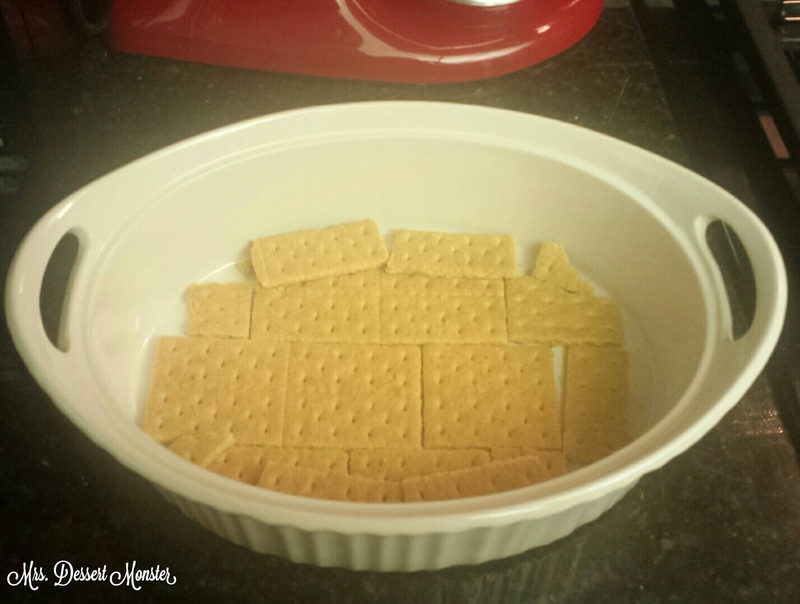 In a deep pan, place a layer of graham crackers. 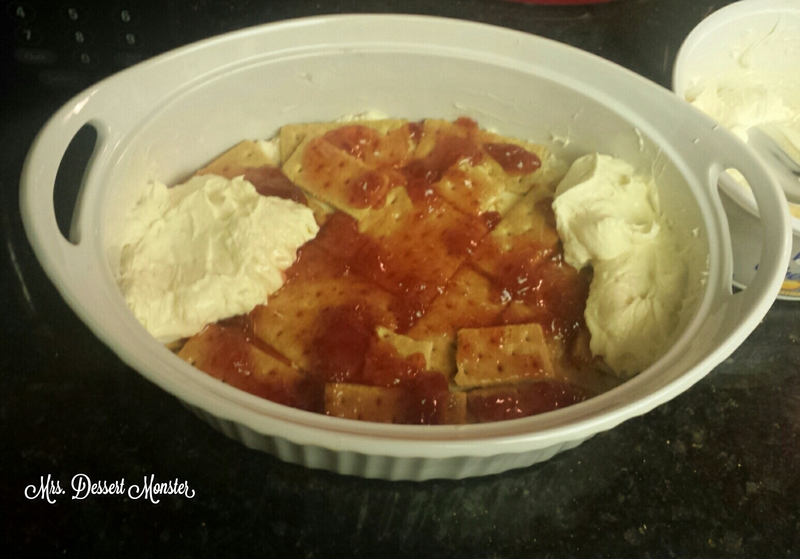 Cover the graham crackers with a thin layer of jam, then a layer of cheesecake filling. Repeat 3 times. 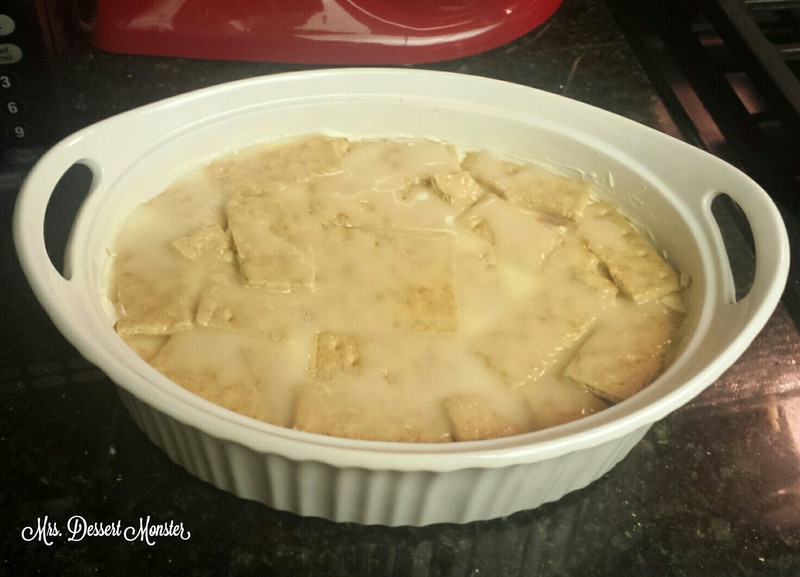 Microwave lemon buttercream so that it’s runny & pour over the top layer of graham crackers. Happy Wednesday! The work week is half over & Memorial Day weekend is coming! 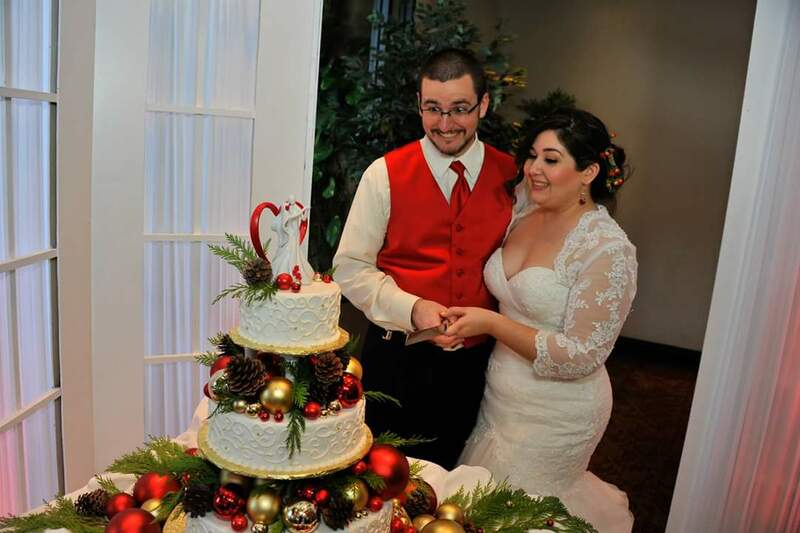 Today I wanted to share our wedding cake with y’all. 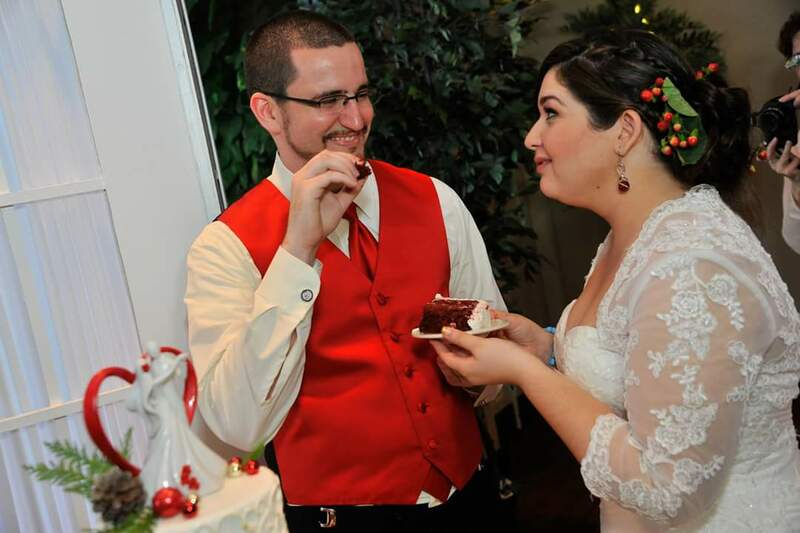 Our venue included the cake & gave us 2 vendors to choose from. We went with Edible Creations. 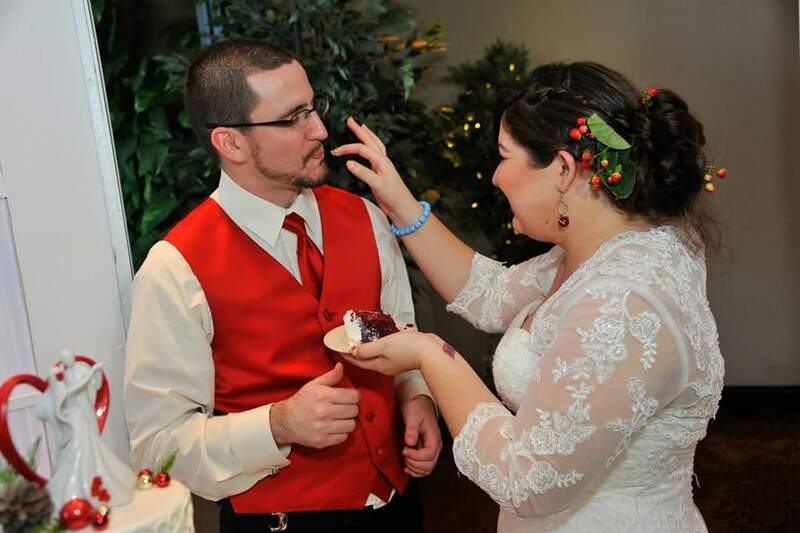 They have an awesome selection of flavors & their cake decorating is amazing, too! 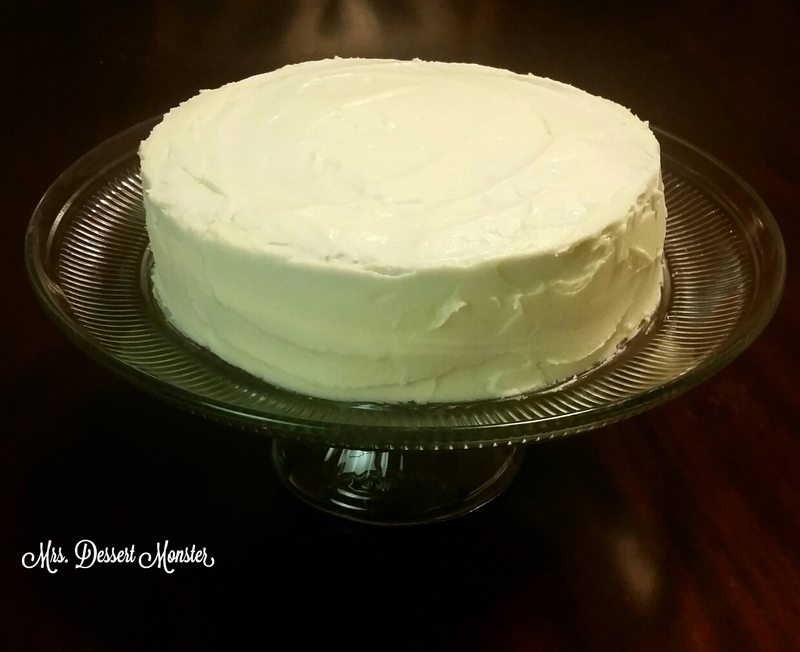 We chose Vanilla Rum & South Florida Red Velvet – it’s red velvet with a hint of key lime! 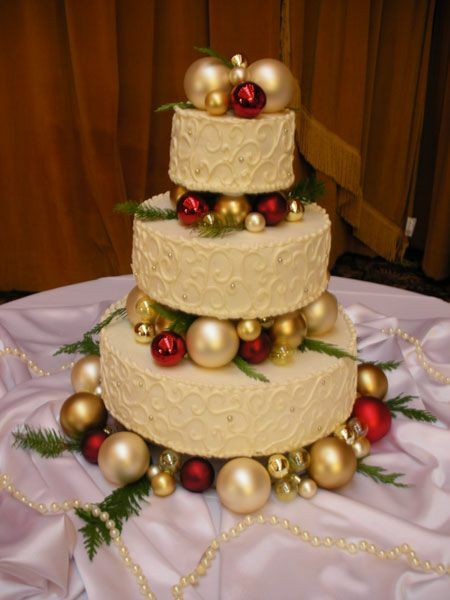 This is the picture I got from Pinterest & showed the cake decorator. This is the cake we got. So much better than we could have ever expected! 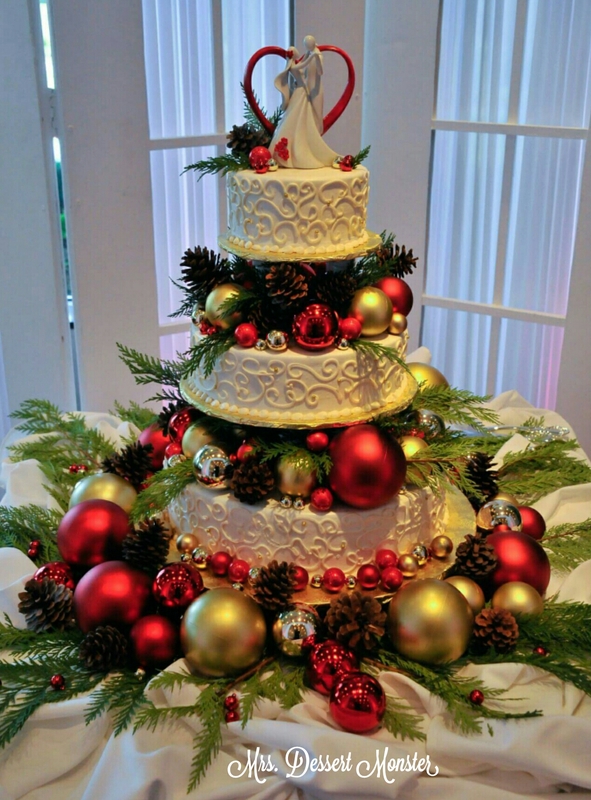 The cake itself is pretty simple, but the Christmas decorations put it over the top! 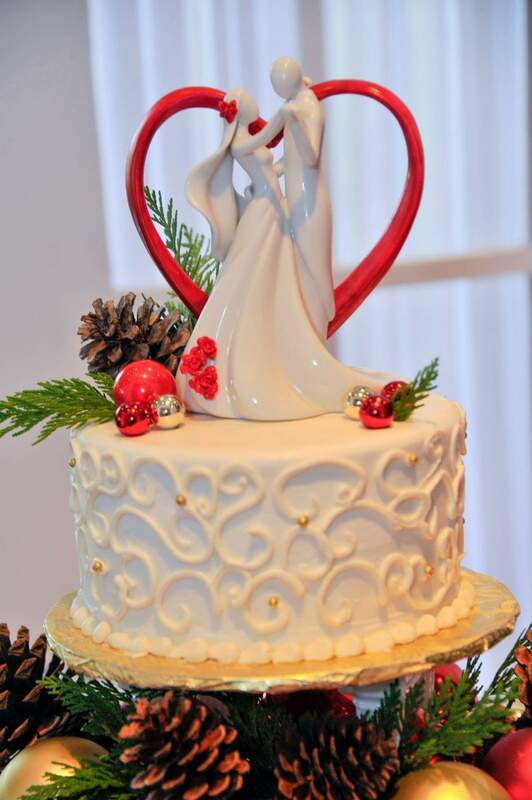 I bought a ceramic cake topper & personalized it a bit by painted the red accents. 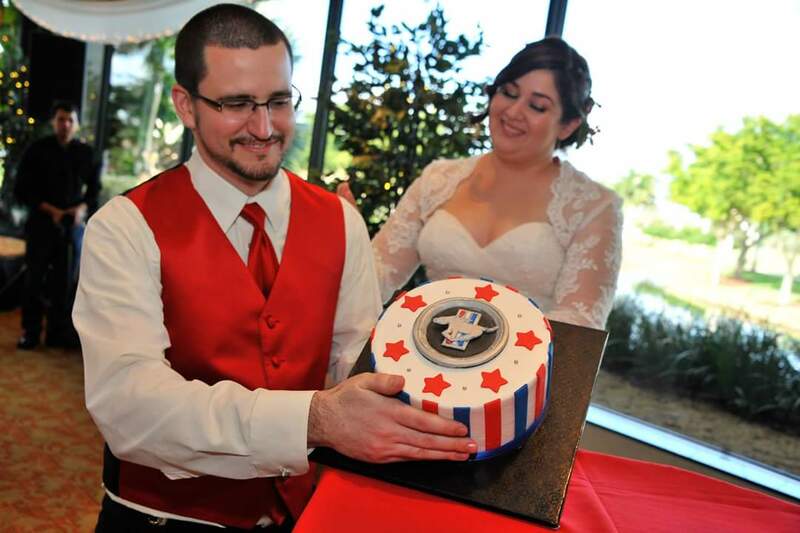 We were very excited to cut into it, as you can see. 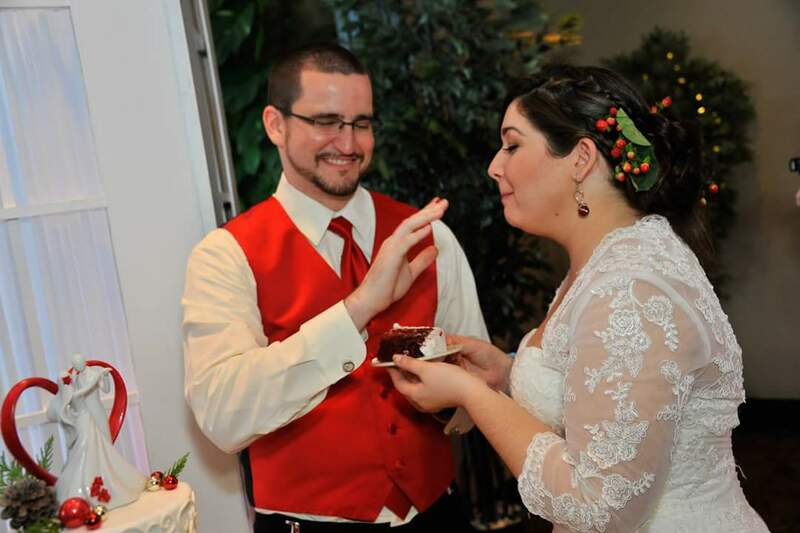 We had a no cake smashing rule. He thought about it, though. My husband knew he was getting one, but the design was a surprise to him. He loved it! See you next Wednesday for more wedding fun! 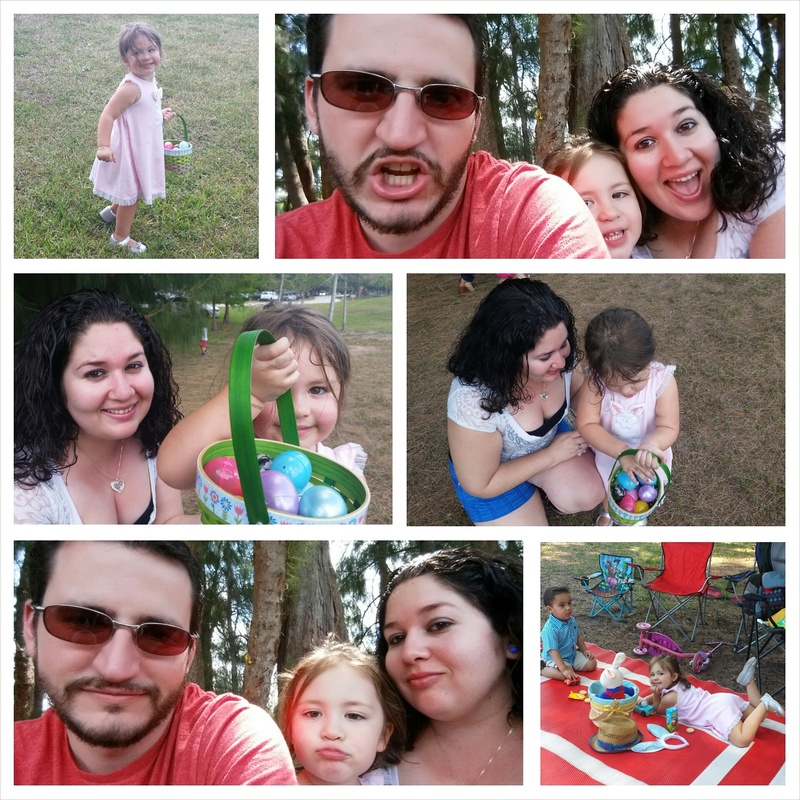 Today my husband & I took our niece to an Easter egg hunt my coworker put on. It was a lot of fun! Everyone brought a little something to contribute, so of course I brought dessert. 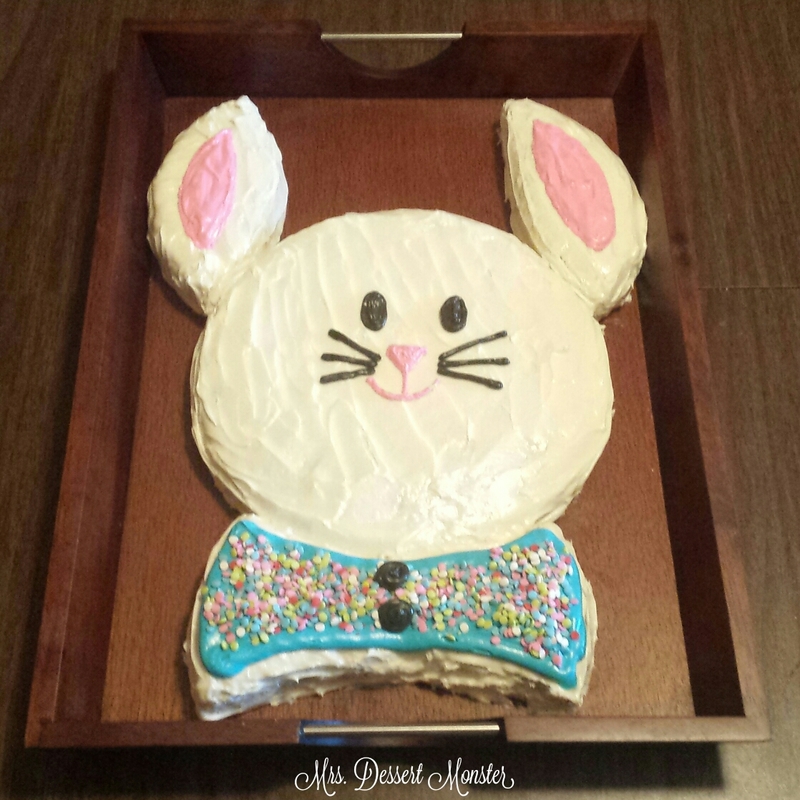 This Easter bunny cake was super easy! Apparently it’s an old Kraft recipe. 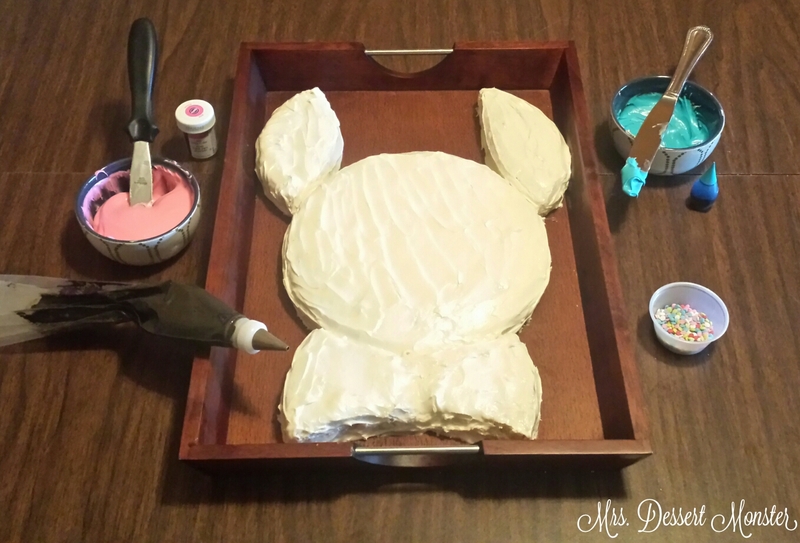 I used the template below to cut 2 round cakes into the necessary shapes. I actually used a 9″ cake for ‘A’ & an 8″ cake for ‘B’ & ‘C’. I liked this a little better than the pictures I saw online because the ears & the bow tie weren’t giant. I baked my cakes, cut the pieces, & frosted them individually. Then, I assembled them together. The kids (and the adults) loved it! 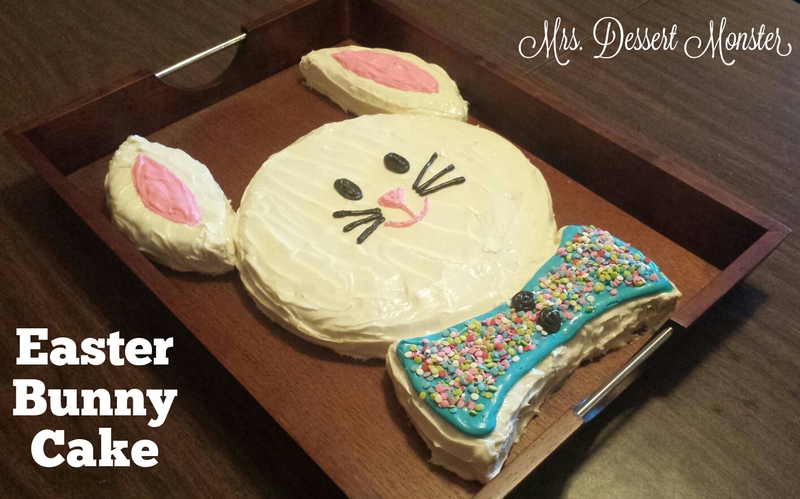 This is a great bunny cake because you can get as fancy or as creative as you want! Today was a very nice day spent with family & friends.